Major General Gordon Lindsay Maitland AO OBE RFD ED (1926 – 2018) was born in Rockdale on 25 August 1926. He was aged just 17 when he enlisted in the 2nd AIF during the Second World War; as an enlisted man he was identified as intelligent, sent to the Army school of languages. 1947 saw him commissioned, serving in the allied translator and interpreter section. He was fluent in Japanese, he translated at the trials of Japanese war criminals in Indonesia. After the war he continued to serve and rose through the ranks earning the OBE as a battalion commander and the AO as the commander of the 2nd Division. When his army career ended he was Chief of Reserves at Army Headquarters and a member of the Chief of Army's Advisory Council. His civil life was also distinguished; CEO of The Royal Agricultural Society; member of NSW Government Committees; Chief Manager of the Commonwealth Bank. For the last 30 odd years he has devoted his life to commemorative and community activities, particularly assisting veterans and their organisations a number of which he has led. He has also had a lifelong dedication to military history and has had 6 books published. 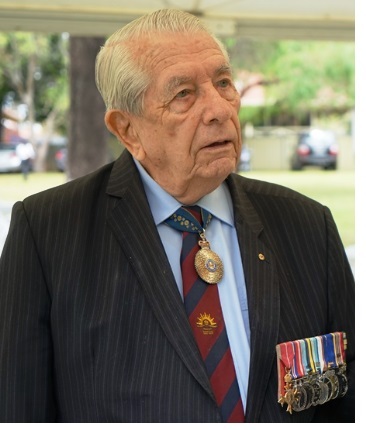 Gordon Maitland was a long time champion and supporter of the Battle for Australia Association and although he could not attend our recent events due to health reasons, we remember his great contribution to our nation. General Maitland passed away on the evening of 17/18 October 2018. General Maitland's military funeral was held at St James, King Street, Sydney on Monday, 29 October 2018 at 10:30. The funeral was well attended with the Governor General, the Governor of NSW and many soldiers who served under the General present. General Maitland's family spoke eloquently at the service. It was followed by a procession to and service at the Cenotaph, Martin Place. Below find some images of the services. The Order of Service can be downloaded HERE. CLICK HERE to download Major General Paul Brereton's comprehensive eulogy delivered at the funeral service.